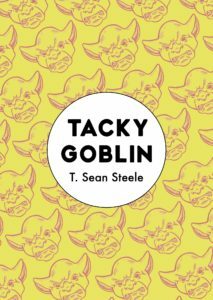 Other than its diaristic form, Tacky Goblin doesn’t seem like a book that started as a blog. In the cursory research I did about other blogs that became books, I learned that most of them were in genres you’d expect: self-help, food writing, etc. – practical books about how to fix or make things. To my knowledge, none were surrealistic romps through the unconscious fears and desires of downwardly mobile millennials, like Tacky Goblin is. But blog-to-book is the origin story that accompanies T. Sean Steele’s debut novella. He started the blog in 2013, when he — like the unnamed narrator of the book — moved to Los Angeles to join his sister, Kim (who retains the same name in the book). Bored with standard blog fare, he found himself writing short pieces about mid-20s life refracted through an absurdist lens. The entries quickly amassed a following on Facebook, and in 2015, Steele submitted a collection of them to the Wild Onion Novella Contest held by Curbside Splendor Publishing, won the prize, and received a limited edition printing of the book. The novella is now getting a second life, republished by Unnamed Press. “Novella” doesn’t quite the capture the book’s form. Though they feature the same narrator and cast of characters, there isn’t a narrative build—or any narrative tension—in the short entries. Steele said in an interview that he was interested in it as a “vehicle to tell jokes,” which partially gets at what the entries feel like. But the value of the book is less in the jokes it tells (though some moments are quite funny) and more in the particular images Steele creates — how these images distort this historical moment, and in doing so, reflect it as well as any work of realist fiction has. Bizarre developments, frank symbolism, and deadpan responses to both the absurdism and what it might mean — this is what the book trucks in, and, after these early pages, things only get weirder. Soon the narrator begins having conversations with the “mold mouth” on his ceiling. The mold mouth — dangerous demon or guardian angel, who’s to say? — replaces his nonworking legs with a pair that are rippled with muscles and “thick as tree trunks,” though don’t quite match the narrator’s skin tone. Steele pulls off the general weirdness of what happens because his prose is unfussy, clear, and funny. It is always easy to understand what has happened, even if we don’t know why. When, after initially complaining to the mold mouth about replacing his legs without his consent, the narrator realizes the new legs are an improvement, the mold mouth responds by saying, “You’re good to go. You’ve got a set of ham hocks on you now. Some serious canons. Choice cuts of meat.” Steele’s ability to make things like talking spots of mold use the language of CrossFit bros is what keeps even the most surrealistic aspects of the book entertaining. More than a plot, the novel comprises moments like these, so I’ll just mention a few that encapsulate the book’s tone. After moving (new legs intact) to Los Angeles, the narrator sleeps on the couch in the living room and avoids looking for jobs by doing drugs with his neighbor, Laurie, whom he also sort of dates. When taking the unmarked black pill his neighbor gives him, the narrator hallucinates Larry, a “clean cut” guy with a “doughy baby face.” One day, after taking too many black pills, the narrator brings Larry into existence. The difference between Larry being a hallucination and being “real” is somewhat ambiguous, but it has something to do with the fact that he now sweeps the floor and can talk, issuing banal statements like, “What is this, the Internet? That’s great…The whole world’s out there,” when looking at the narrator’s laptop. The mundanity of Larry’s existence notwithstanding, Laurie is upset that the narrator has made Larry come alive, so the narrator vomits the pills back up, effectively killing Larry. One day, the narrator’s sister comes home with a dog, but when the narrator looks at it, he sees a baby. They name the dog/baby Barb. Though Steele himself has downplayed this element in interviews, there is more happening here than humor or entertainment. At face value seemingly random and utterly bizarre, the book delves into fears both elemental and historically specific. If you squint, the book is a surrealistic compendium of millennial trend pieces. Feeling stuck because you’re expected to be flexible enough to move across the country for an opportunity? Drug use the only basis of your friendships, ultimately leading you to isolate yourself? Facing the reality of never being able to afford a child, so opting for a pet instead? The eeriness of boomer parents spending your childhood trying to stay cool and act more like they are contemporaries than adults? By literalizing these fears in his absurdist plots, Steele puts out into the open what is often felt but rarely given credence. The odd images Steele creates aren’t treated with outsized dread or angst, and even when the humor is dark, it isn’t nihilistic. The world of Tacky Goblin is one where we’ve known we aren’t the masters of our fate for a long time. Instead of being overwhelmed with existential alarm, Tacky Goblin communicates the disorientation of being confronted with our powerlessness in the face of social forces beyond our control or understanding, and does so with warmth, understanding, and the occasional mold mouth. Kevin Pickard is a writer and PhD candidate living in Dallas, TX.